Available as a Limited Edition Giclée print, LIMITED TO 100 COPIES ONLY, the first 20 of which are reproduced on canvas just like the original oil painting. Our Giclée prints are individually printed using inks which provide the best colour and finest detail of any prints we offer. The whole process is under Graham Turner's control ensuring excellent quality and a picture that is as close to the original as possible. Print numbers 21-100 are individually printed on heavyweight (300gsm) acid free art paper. click on image to enlarge Scroll down to see a larger cropped detail image. Print numbers 1-20 are individually reproduced on canvas, stretched on wooden stretcher bars just like the original oil painting. Master at Work - Stirling Moss guides his Vanwall to victory at the 1958 Dutch Grand Prix. One of motor sport's most successful and charismatic drivers and the only man to win the Formula One World Championship, the Indianapolis 500 and the Le Mans 24 Hours. 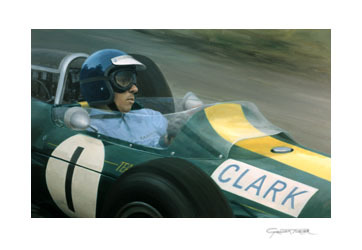 Graham Turner's painting shows him at the wheel of the BRM P57 that he took to his first Grand Prix victory - at the 1962 Dutch Grand Prix.